Walter Lewis (right) received the Freedom of the Parish at the December 2015 meeting of Teynham Parish Council. He retired in the summer of 2015 after 36 years as a Parish Councillor, and he was also organist at St Mary’s Church, Teynham, for 72 years. He’s the first recipient of a Teynham Freedom award, which honours his long and eminent service to the community. 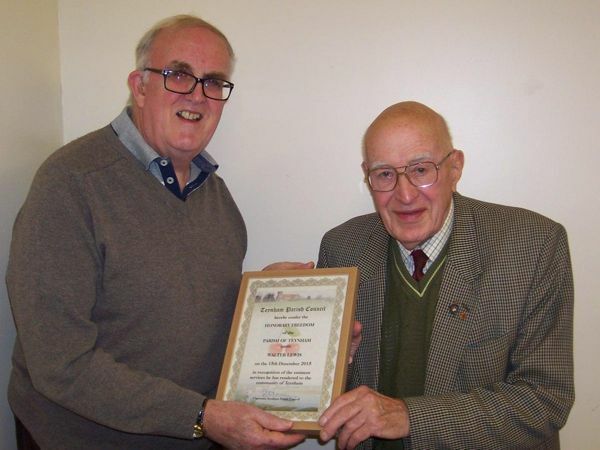 At a ceremony involving the current Parish Councillors and a few invited guests, he received the award from the Parish Council Chairman, Brian Sharman (left). Walter Lewis retired this year (2015) from public service with a record that will surely never be surpassed in this community. He served as a Teynham Parish Councillor for 36 years, much of the time as Chairman or Vice-Chairman, and for a long time was President of Teynham and Lynsted branch of the Royal British Legion as well as being Chairman of the Managers of Teynham Primary School. But his service to St Mary’s Church, Teynham, goes back even further as, in addition to being a churchwarden there for 24 years, treasurer for 19 years and head chorister in his school-days, he was organist for an amazing 72 years. The only child of Albert and Violet Lewis (his dad was gardener for the High Commissioner of Palestine at a property in Nouds), he attended Teynham Primary School until he was nine and then won a scholarship to Faversham Grammar School. He was already a choirboy, and a teacher at Faversham further encouraged his interest in music. He became organist at Teynham Church at the tender age of 14, was also organist at St Catherine’s Church, Preston, for 15 years, and proudly remembers playing The Crucifixion at a church concert while still at school. Walter’s first job was at Westminster Bank in Sittingbourne but he was soon called up - “that frightened the Jerries,” he grins. He served three years in the Royal Army Service Corps and remembers it as a worthwhile experience which did him good. On his return he worked for a short time at a mushroom farm near Lynsted before deciding it wasn’t for him. He was then articled to A J Turner and Son estate agents in Park Road, Sittingbourne, and after being taken into partnership he later took over the business and carried on until he was 65. He enjoyed the auctioneering and rent collecting, as well as selling houses, and has nothing but fond memories of his years running Lewis and Partners of 4 Park Road. Walter and his wife Vera had two sons – Martin, who farms at Lower Frognal, and Stewart, who tragically died at the age of 20 from a cerebral haemorrhage. All through his life, he’s shown great willingness to get involved in good work for the community. He first joined the Parish Council in 1977 at the invitation of then chairman Bill Hook. He recalls: “I felt my experience through work was of help, but it was much more easy going then than now. It’s not as technical as it is now with all this legislation for this and that.” He retired as a Parish Councillor in May when elections took place. He’s proud of his time running the local branch of the Royal British Legion, which included an invitation to a very special day out at a Buckingham Palace garden party. He and Vera were invited there by John Jennings, the Deputy Lieutenant of Kent. And he remembers with equal pride his work as Chairman of the School Managers, particularly recalling the day when, as a former pupil himself, he organised the dedication of the new school in its present home. Walter was the key figure in the restoration of the Lychgate at the Parish Church in 2008. The work was funded by grants, sponsorship and donations – and Walter’s grandson, William Lewis, set the standards when he raised £600 through a sponsored pony ride. The absolute highlight of his enormous contribution to church life for more than three-quarters of a century came in 2002 when he was selected to receive Maundy money from Her Majesty The Queen at Canterbury Cathedral. Maundy money is presented annually to people for their services to their church and community over the years. It’s been a long, fulfilled and honourable life. There will never be another like Walter Lewis.